Welcome to the Grand (Re)Opening of This Delightful Habit of Journaling! Believe it or not, I started this blog two years ago. I meant it to replace AustenBlog, because I wanted more freedom to blog about everything that interested me, not just Jane Austen, though I can’t imagine any blog I write not being heavily influenced by my love for Jane Austen’s work. However, I found myself unable to kill AustenBlog. I stood above it with my knife, ready to stab it through the heart, and couldn’t do the deed. If this were Shakespeare, I would come to an ugly end, but fortunately it’s just a blog. Last year I decided to get serious with blogging again (hoping it would kickstart my writing in general…not so much so far, but we live in hope) and a few weeks ago, I contacted my friend and fellow Janeite Rhonda Ortiz, who has a writing and design business, to help me make the blog pretty. I think she did a smashing job. Considering I gave her next to no guidance as to what I wanted, because I didn’t know what I wanted, she still managed to figure it out. I couldn’t be happier with how it turned out, and it’s had the same effect of getting a nice fresh clean Moleskine journal or pretty tablet of clean paper–it makes me want to write. As far as what I’ll be writing, it’s a work in progress. I’m currently involved in a project to read all of Georgette Heyer’s books in order of publication, creatively titled All of Heyer. I’m not too far along yet; just getting to These Old Shades. I would like to post more about my crafting stuff, for those who might be interested in that. I’ll post about my techy gadgets, though I know no one cares as much as I do. 🙂 And maybe a little bit about the writing process, if it doesn’t come across as too precious. Of course I will post updates to anything I’m going to actually publish! That also is a work in progress, but getting two blogs in shape for the future makes me feel very accomplished. They even both now have responsive designs, meaning they will work on mobile devices as well as desktops, and I won’t fall into the slough of despair that is Mobilegeddon. You, Gentle Reader, can follow HaJo (as I’ve taken to calling this blog) one of several ways. Sign up to receive an email each time I post. I’ll try to not post more than once a day! There’s a space to enter your email address (or just click the Follow button if you’re logged into WordPress.com) in the right menu, or all the way at the bottom of this post if you are on a mobile device. If you are a member of WordPress.com (and you don’t have to have a blog to join), at the top of the page should be a black bar with a link to click to follow this blog. That’s true for any blog on WordPress.com (as opposed to those who host their own installs), and you’ll receive new blog posts in your WordPress reader. Follow me on social media. The links are at the top of the right menu (or scroll to the bottom of this post, if you’re reading this on a mobile device). When something new is posted on this blog, there will be an automatic posting to Twitter, Facebook, Tumblr, and Google+. Or kick it old-school with an RSS feed. 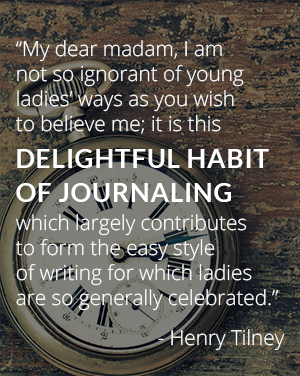 Thanks for checking out This Delightful Habit of Journaling–the title, by the way, comes from Northanger Abbey–and I hope you will stick around! P.S. Come back around 5 p.m. US EDT…Dorothy’s going to be throwing a little party. I’m looking forward to reading all of your Heyer reviews! Maybe as an ebook? I have been thinking about it.